Events in Devon in July are very popular. School holidays are coming up and the family are looking for things to do. If you are thinking of entering or booking an event, make sure you are the early bird!! Exeter Craft Festival will be held on 4th to 6th July 2019 on the Cathedral Green. Budleigh Salterton Music Festival will be held on 12th to 20th July 2019. Exhilarating days of the very best in opera, music, and other events. Festival of Archaeology 13th to 28th July 2019. Over 1000 events held all over this country that is so rich in prehistory.This event will form part of the 75th anniversary of the Council for British Archaeology. The Lundy Race Ilfracombe Yacht Club have announced that the Lundy Race will be held on 20th July 2019. Mid Devon Show Tiverton. 27th July 2019. Non stop activity all day!!! Paignton Festival. 27th July to 4th August 2019. Previously Torbay Carnival. Lots of fun. Totnes & District Agricultural Show 28th July 2019. Berry Farm, Berry Pomeroy, Totnes. Modern but over 90 years old and one of the best in Wessex and even perhaps the country! Woolsery Agricultural Show will be held on 29th July 2019 at Clovelly Court. A most popular North Devon event. 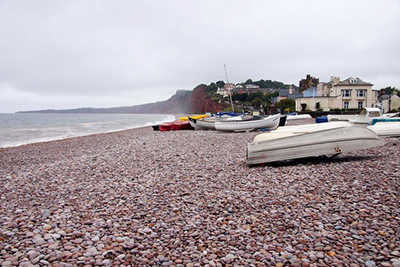 Budleigh Salterton on the Jurassic Coast and an Area of Outstanding Natural Beauty. The beach is pebble like much of this area but it is safe for bathing. Take a relaxing holiday in this lovely spot. Exeter, one of the two large cities in Devon, the other being Plymouth. It is an attractive city with some unique shopping spots. Northernhay Gardens are next to the ruined castle, a very pleasant place. 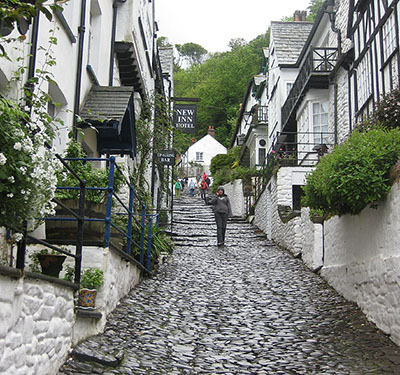 Clovelly, a lovely little town, hilly cobbled streets, plenty of events, on the northern coast on the Bristol Channel. Lundy is actually part of the parish. There is access to the South West Coastal Path. Tiverton, home of the lovely Tiverton Lace still being produced today. Tiverton Castle is open during the summer. The Pannier Market has recently been redeveloped. Torbay, the English Riviera. Popular with early humans as well, see Kents Cavern. Was a completely different place then, a wooded valley, but now the wonderful bay opens out in front of you. Torquay, Paignton and Brixham are the local resorts. 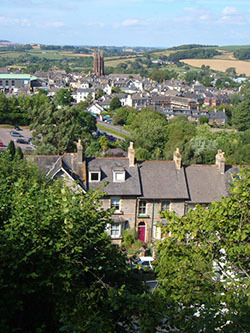 Totnes is a picturesque market town on the River Dart. English Heritage own Totnes Castle which rises high above the town. The town now has a 'New Age' image alongside the ancient. Paignton Blue Flag beaches in the English Rivieria. Lovely place for seaside holidays.